Less than 4 miles from downtown Pigeon Forge, Keaton’s Kottage is a 16-person cabin with enough space and amenities to set the stage for a great family reunion or group retreat. This 5-bedroom, 5-bath cabin offers more than 4,000 square feet of space, elegant furnishings, and tons of entertaining amenities. A few of those amenities include a private theater, a game-equipped loft, multiple outdoor hot tubs, and an indoor private pool! You’ll also have access to a community outdoor pool and hot tub thanks to this cabin’s location in the Sherwood Forest community. The sister lodge to Keaton’s Kabin, Keaton’s Kottage is available for a 16-person stay, or you can rent both cabins for double the fun! This is a great option for those planning large company get-togethers, destination weddings, or church retreats. 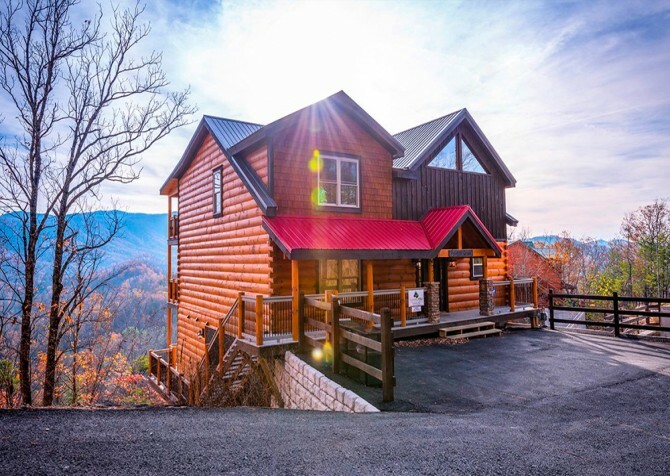 Both cabins offer a pet-friendly atmosphere, peaceful views of the Smoky Mountain trees, and easy access to popular attractions along the Pigeon Forge Parkway. The first of many big screen TVs provided by Keaton’s Kottage can be found in this cabin’s large and inviting living room. If you’re visiting during football season, get the whole group together to watch the big game on Sunday afternoons. Or maybe you’re planning a vacation during the holidays. Use the spacious living room to play Dirty Santa after buying cute gifts at The Village Shops in Gatlinburg. Beneath the TV, you’ll find a stone electric (heat) fireplace—a much-needed amenity for wintertime retreats. And in the center of this space, enjoy multiple seating options that offer the epitome of comfort and style. Two full-size leather couches, two matching chairs, and two padded rockers provide enough seating for the majority of your group. 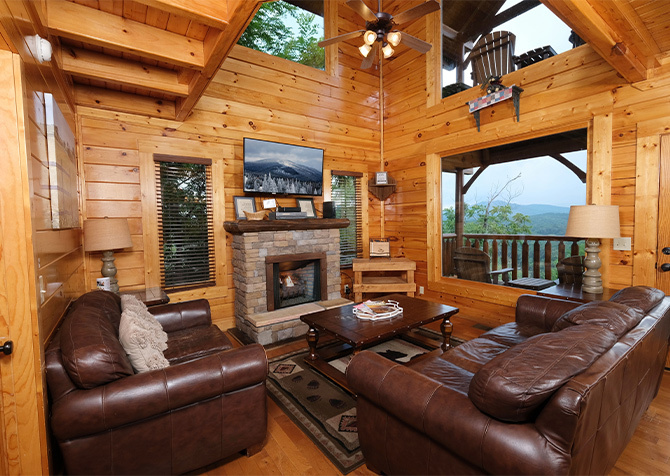 Enjoy snacks from the coffee table, a quiet evening by the fire, and multiple rows of large windows with peaceful views of the Smoky Mountain trees. The open-concept design of Keaton’s Kottage makes the large L-shaped kitchen easy to find from the living room or dining room. This updated space features granite countertops, honey-colored cabins, and stainless steel appliances. And you won’t find just 1, but 2 of nearly every major appliance you’ll need! 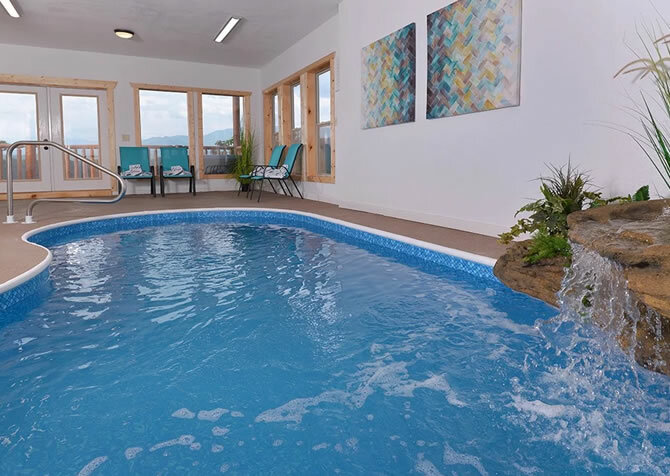 Keaton’s Kottage wants to make sure your group has enough space for large group meals, special events, and even in-cabin catering during your Pigeon Forge stay. So be sure to use your double refrigerators, double ovens, and double microwaves. This kitchen also provides extra prep and serving space with its matching island and several extra countertop appliances, including a crockpot, blender, coffeemaker, and toaster. Adjacent to the kitchen is your elegant dining space inside Keaton’s Kottage. A dark-stained table with place settings for 8 will be the focal point of your family’s holiday dinner or game day spread. For extra seating during mealtime, be sure to utilize this cabin’s 3-piece breakfast bar as well as the comfortable couches in the living room. And on the porch, enjoy a 6-piece patio set that overlooks the Smoky Mountain trees. All of these options are great alternatives to dining out—you’ll love the privacy, elegance, and comfort provided by Keaton’s Kottage! Now we’re getting to the fun part of Keaton’s Kottage—beginning with this cabin’s large, game-filled loft! A pool table, shuffleboard table, and big screen TV aren’t the only entertaining options you’ll find inside this cabin. For all the gamers out there, enjoy multiple modern arcade games as well, including a driving game, a 2-person shooting game, and a digital golf game. And if you’re into golfing, don’t miss these nearby golf courses in the Smoky Mountain area. This loft is sure to be your group’s favorite hangout space with hours of fun for kids, grown-ups, and everyone in between. 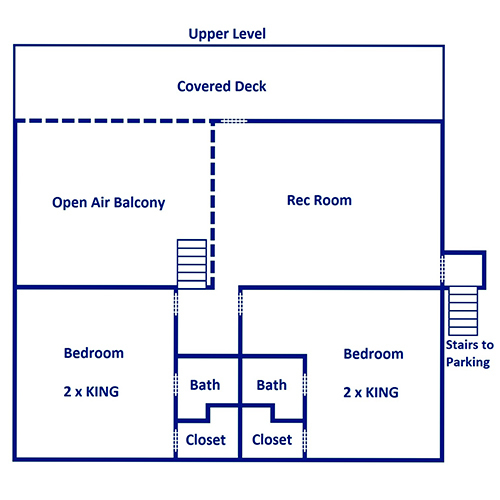 You’ll also find a comfy couch and direct porch access—all in this one convenient location. Want another way to entertain your group while you’re out of town? How about the private theater room inside Keaton’s Kottage! 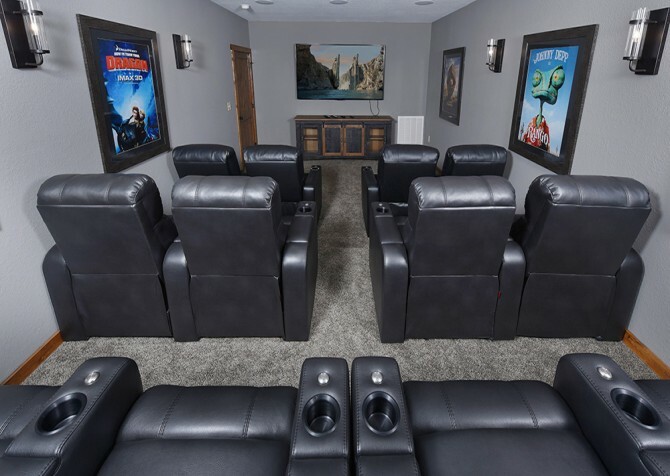 This fully enclosed space with tiered seating and a big screen TV will transport you to the movies during your Pigeon Forge stay. Bring the popcorn and your favorite DVDs or Blu-ray discs, and get ready for a relaxing night with 3 levels of oversized leather chairs. Movie night in Keaton’s Kottage will be exactly what your group needs to relax and unwind after cycling in the park or walking downtown. And don’t forget—this cabin is pet friendly, so furry friends are welcome to curl up on your laps for the show! Things just get better and better at Keaton’s Kottage, especially as you arrive to your private indoor pool - kept at 85 degrees! This large rectangular pool is a great option for groups visiting in the fall or winter. You won’t have to worry about freezing in this temperature-controlled water. But it’s also a great option in the dead of summer, when it’s just too hot to hang out in the outdoors. Lined with Adirondack chairs, this pool offers natural light, all-wood walls, and complete privacy. And if you need more space, remember that Keaton’s Kottage provides free access to an outdoor community pool as part of the Sherwood Forest community. Inside Keaton’s Kottage, you’ll find sleeping space for 16 guests. 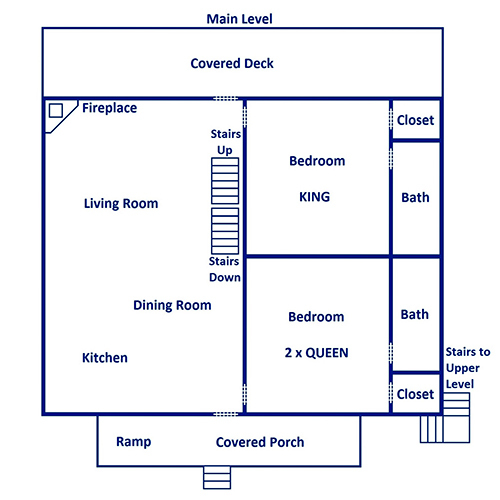 This is all comfortably divided between 5 rooms with 6 king-size beds and 2 queen-size beds. Three of the bedrooms offer 2 beds each, but don’t think you’ll be crowded. These rooms are huge and come with comfortable seating and homey furnishings as well. Every bedroom inside Keaton’s Kottage offers elegant wood furniture, modern bedspreads, and a huge flatscreen TV. Even the bathrooms have their own flatscreens inside Keaton’s Kottage! Enjoy the best of comfort, class, and convenience inside this pet-friendly, large group cabin. The peaceful ambiance of the Smoky Mountain trees—this is what you have to look forward at Keaton’s Kottage! Enjoy dinner on the deck with the 6-piece patio set or sip a glass of fresh-brewed coffee from a row of rocking chairs. You’ll even have access to 2 outdoor hot tubs, which is perfect for relieving sore muscles after hiking in the Smokies in the nearby national park. With 3 large decks, Keaton’s Kottage provides plenty of room for 16 guests (and their furry best friends) to spread out and enjoy the fresh mountain air. And be sure to plan some grilling nights at Keaton’s Kottage with your outdoor charcoal grill. 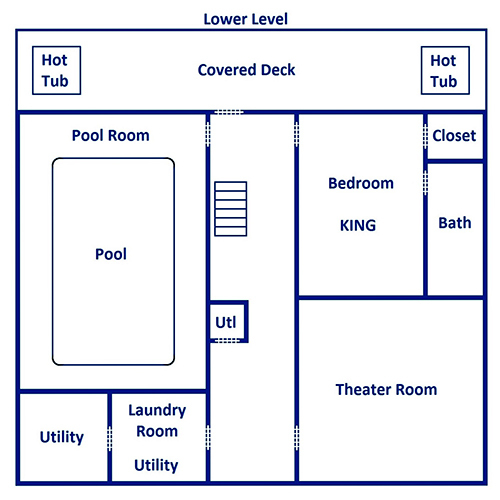 As part of the Sherwood Forest community, Keaton’s Kottage provides access to a community outdoor pool and hot tub. These are in addition to the double hot tubs and indoor private pool at the cabin itself! Other amenities you’ll enjoy inside Keaton’s Kottage include high speed wireless internet, access to a washer and dryer, and a flat, paved driveway with 6 parking spaces. 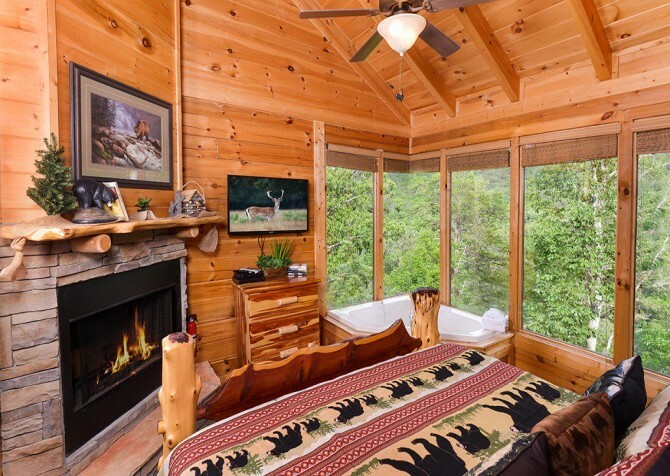 This pet-friendly cabin has all the conveniences of home and plenty of entertaining extras to help you make the most of your stay! An outdoor adventure park with multiple zipline tours, you’ll find an option for every age group at Smoky Mountain Ziplines. Dollywood isn’t Dolly Parton’s only family-friendly attraction in Pigeon Forge. Check out this dinner show with 32 show horses and their world-class riders. Located at The Island, this 200-foot Ferris wheel provides impressive views of the Smokies during the day and the Pigeon Forge lights at night.<.